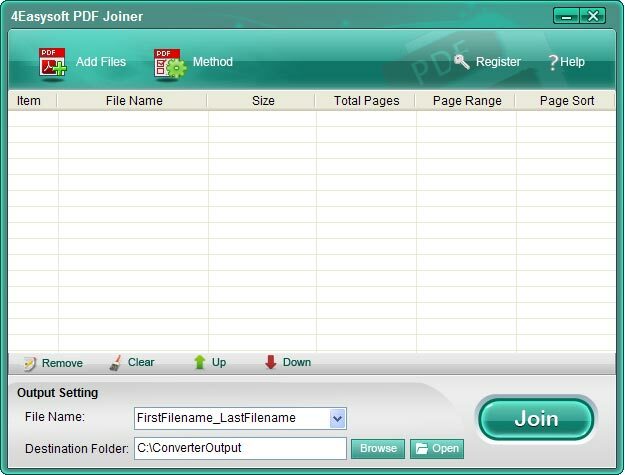 4Easysoft PDF Joiner 3.1.06 Free Download - It can merge multiple PDF files completely to a new PDF file. 4Easysoft PDF Joiner can not only help you join any selected PDF pages of multiple PDF files to a new one, but also enables you to arrange page ranges and page sorts at random to output PDF file. In addition, you need not to preinstall Adobe Reader or Acrobat. Plus, its language-supporting function is very powerful, therefore, you can read multi-language PDF files, including English, Turkish, Thai, Latin, Korean, Greek, Cyrillic, Arabic, etc. 4Easysoft PDF Joiner supports multi-language PDF files, including English, Turkish, Thai, Latin, Korean, Greek, Cyrillic, Arabic, Japanese, and Chinese. This 4Easysoft PDF Joiner is an independent software, which does not need to install Adobe Reader or Acrobat in advance. With user-friendly interface and easy operating steps, you can easily use PDF Joiner to merge any PDF files to a new PDF file. You can select any one way from All, Odd, Even and Part(e.g. : 1, 3, 6-18) with PDF Joiner, four page arrangements to choose any pages in PDF files. You are allowed to choose Sequence or Reverse to arrange page sequence of output PDF file. PDF Joiner enables you to mix pages by every n page(s) or repeat mode, then to join all files alternately. Statement: First, please download the orginal installation package by clicking the download link. Of course you may also download it from the publisher's website. Using 4Easysoft PDF Joiner crack, key, patch, serial number, registration code, keygen is illegal. The download file hosted at publisher website. We do not provide any download link points to Rapidshare, Hotfile, Depositfiles, Mediafire, Filefactory, etc. or obtained from file sharing programs such as Limewire, Kazaa, Imesh, Ares, BearShare, BitTorrent, WinMX etc. Software piracy is theft. If you like 4Easysoft PDF Joiner please buy it.